Today I’d like to share two light little tidbits that you may have missed in the hubub surrounding the healthcare debate and UN climate conference. 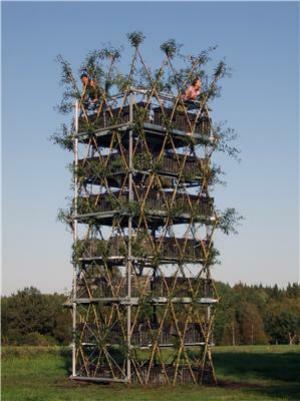 First, Science Daily reported that scientists and designers in Stuttgart have developed a “baubotanical” tower made from living trees. They explain that the goal of the “research is to design and to build living plant constructions as architectural bearing structures in the dimension of fully grown trees” but it is unclear, to me at least, what some of the practical applications might be. I mean, it’s a neat idea, in an engineer-meets-peter-pan sort of way, but what could people actually do in these structures? And won’t the 8-10 year construction/growth period pose a few unique problems? 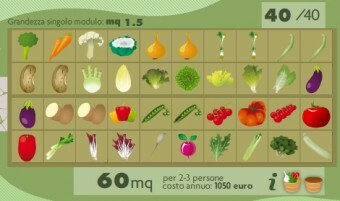 In other intriguing green news, an Italian agriculture firm has begun offering it’s customers the opportunity to reconnect with where their food comes from by allowing them to design, plant and eat from their own plot–all from the comfort of their desktop computer. Again, this super-CSA is a pretty neat idea but does it strike anyone else as a little absurd? I mean, can we really say that this is going to reconnect us to what we eat? Or is it more like a new add-on to SimCity has been developed (SimGarden, perhaps?) which has the unique benefit of resulting in actually edible material?